This post is part of our Language & Literacy Development blog series. Stay tuned for more posts in the series! This post gives you 7 helpful tips on introducing language- and literacy-rich dramatic play activities to all preschoolers, adapted from Early Literacy in Action by Betty H. Bunce. Introduce the theme to children. Model or act out portions of a dramatic play activity ahead of time, including children in the action whenever possible. Videos or books are good ways to teach children about unfamiliar themes while enhancing their language learning. Consider inviting guest speakers, such as parents, to demonstrate activities using props, vocabulary words, and actions–a beautician, for example, could explain how to wash and cut hair using a doll. Give “˜em props. Props are an important part of bringing a dramatic play activity to life, teaching kids new words, and exposing them to print. Encourage emergent literacy skills by choosing activities and using props that incorporate print. Some examples: a restaurant activity using signs and menus, grocery-store play using tags and labels, a motel theme using a sign-in register, an office scene using old computer keyboards and notebooks, and library play using shelves of books and pretend library cards. Get kids on a role. 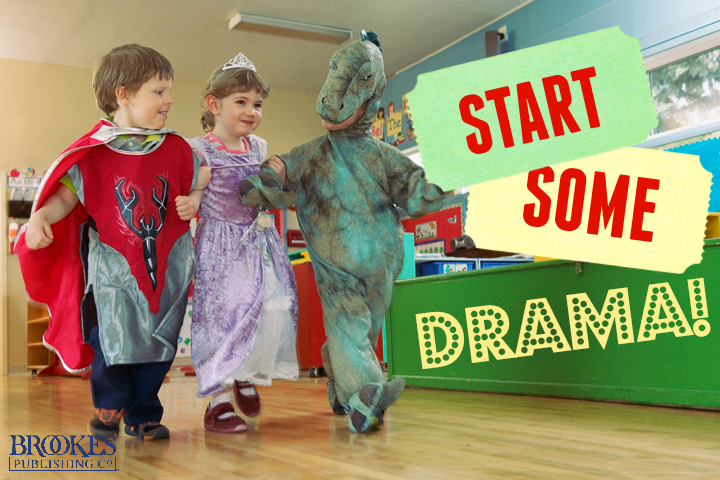 When initiating dramatic play activities, make sure there are lots of different roles available. When kids play “house,” for example there might be parents, children, neighbors, and pets. Having a variety of roles in a particular dramatic play is important because it allows many different children to play and talk together. Look for literacy opportunities. Even if the dramatic play activity isn’t literacy-focused, you can introduce opportunities for literacy practice as children play. For example, during a dramatic play activity with a babysitting theme, encourage the “babysitter” to read a book to “baby.” Or if the theme is Art Show, suggest that the kids make signs advertising the show. Act the part. Through verbal exchanges during the activity, you can provide models for the content, form, and use of language. Be sure to use the props and act the part. For example, you might drive your “car” to the child “mechanic” and say “My car needs to be fixed. I think it needs a new battery.” After she fixes your car, you can switch roles with the child to provide models for other types and forms of responses. Mix it up. Children may become so familiar with a particular dramatic play that they become bored with it. 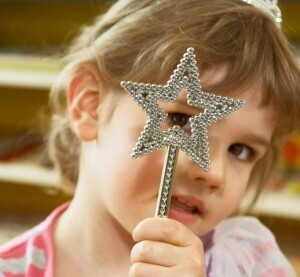 Add novelty–and new words–to familiar dramatic play by adding new or different props or a new focus to the activity. For example, instead of just fishing, children might go ice fishing or go on a picnic where fishing is just one of the activities. Remember: watching is learning, too. Some children may not want to participate in dramatic play, or may want to watch before they decide. Support and encourage observational learning, and don’t require direct responses from children. Letting kids sit out or watch an activity gives them control over their participation, which helps them stay motivated to learn. What are your favorite tips for embedding language experiences into dramatic play? Add yours in the comments below!